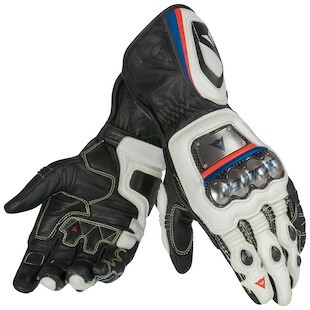 The Dainese Full Metal Pro has been top of the food chain for several years, but Dainese won't leave good enough alone! This year, they've made it better. The reason for the re-design has to do with the new European CE Standard that certifies an entire garment outside of the individual protectors. In this way, the Dainese Full Metal RS Gloves are the most protective option we've seen yet and Rossi, Hayden, and Bradl seem to agree. A small carbon fiber ulna protector is replaced by a larger raised and molded TPU piece at the wrist. The digital elastication has been improved for added flexibility while keeping reinforced Kevlar stitching for protection. The fit on the pinky has been improved to include slightly less pre-curve. This may or may not be an improvement for some. Digital elastication along the thumb is improved and a additional carbon fiber slider has been added. Improved segmentation of materials across the palm for grip on the controls where needed. A low profile scaphoid protector adds comfort and less potential to grab the road in a crash. In addition to all the tech improvements, the Full Metal RS Gloves are now available in several new colors, including Black/White/FluorYellow, Black/White/KawiGreen, and Black/White/MetallicBlue.